It was just after passing the gates to the site of the Festiblues site that I met Alexis with his partner Charlotte. Alexis was in command of the BBQ and the couple was waiting for the first spectators of the evening. 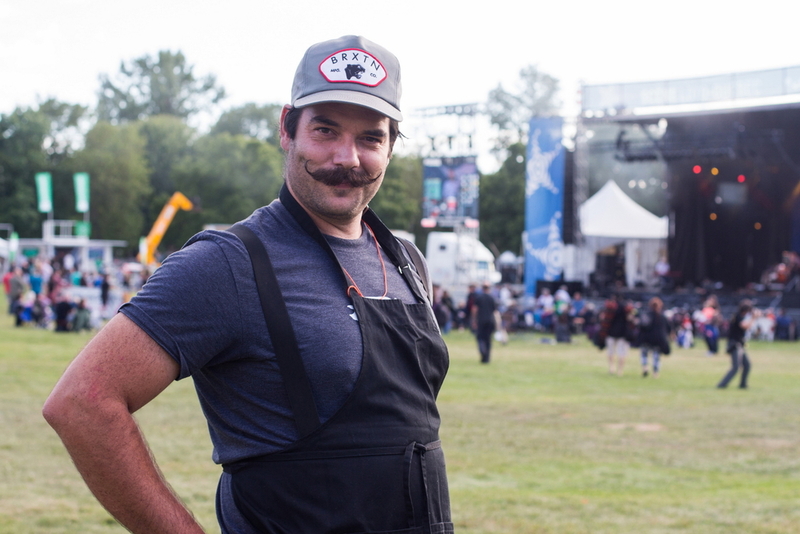 Alexis, who will probably have to keep grooming his characteristic mustache for quite some time as it may very well become a trademark, is a master butcher. With Charlotte and some associates he, opened Ça va barder, a gourmet butcher shop, on Fleury Street West this spring. The investment and the necessary steps for starting it left him "absolutely terrified" before the doors opened. But now, after only a few months in business, the shop already employs sixteen people. Alexis lived in Outremont until the age of 14. Like many people I met to date, he then moved around through several neighborhoods in Montreal. However, he did not know Ahuntsic until recently. It’s while seeking the ideal location for Ça va barder that he discovered the neighborhood. In a few days, he and Charlotte will also become residents. Alexis worked his way around in the restaurant trade. He worked both in the kitchen and as a waiter. He also studied and practiced the art of sommelier. However, he soon realized that he preferred knowing about wine to the actual sommelier profession, which did not make him as happy as he had imagined at first. It is therefore with the belief that one should go to work whistling that he decided to start his own business. He is also a musician in his spare time. He mainly plays percussion, which led him to spend two years in Africa. He told me that he knew many African musicians in Montreal. Standing between the BBQ and the butcher’s shop truck, he told me with assertiveness that one should not eat more than one pound of meat per week, but also that it must be choice meat. Considering meat cutting as a craft and having been trained by master butchers, this man knows what he is talking about! I saw him again the following week. I went to get my bike that had been repaired in a neighboring shop. As I was just a few steps away, I dropped in his store to say hello. He greeted me warmly and proudly gave me a tour of the premises. We went down to the basement where he showed me the smokehouse, the fridge with meat parts labeled from their farm of origin, and another one where store-made sausages were maturing. He speaks of his products with such warmth and conviction that I would not be surprised to see him on TV regularly if one day he is given the opportunity to do so. When I mentioned that to him, he told me that, as a matter of facts, he would be seen shortly in Maria Orsini’s show on Radio-Canada. Something tells me he will keep on whistling for a long time!